One aspect of PAT testing that is becoming an increasing problem is identifying counterfeit and non compliant electrical equipment. Trading Standards report that around £30 million worth of counterfeit electrical equipment enters the UK each year and 90% is made in China. To take a look at this problem, we have randomly purchased 4 packs of BS1362 fuses from a popular online auction site. Even before the pack is opened, it is immediately apparent that these are counterfeit. There is a clear gap between the metal end caps and the ceramic body. 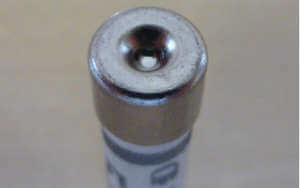 The fuse wire can also be seen trapped between the cap and body causing a bulge in the metal. 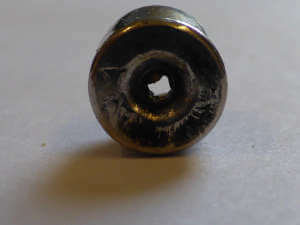 A genuine BS1362 fuse has the internal wire connected to an eyelet inside the centre of the cap. The shiny metal end caps are also a good indicator that the fuse is not genuine. Genuine Bussmann fuses have a dull matt end cap. This fake fuse also has a larger than normal dimple in the end of the cap. The second pack contains 9 mixed fuses in a blue unbranded pack with a plug logo in the corner. 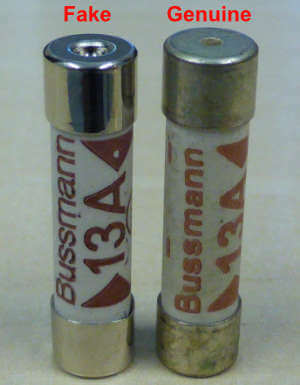 These fuses are again labelled as Bussmann and marked with the ASTA approval symbol. The end caps are shiny metal with a larger than normal dimple, so I suspect that these are also counterfeit. 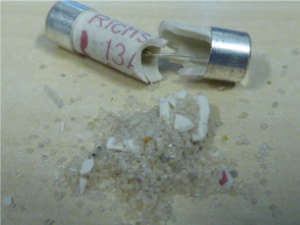 However there is no gap between the end cap and body, or evidence of a trapped wire. 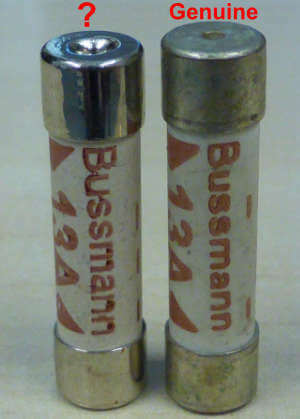 The length of the fuse is noticeably smaller than the genuine Bussmann. 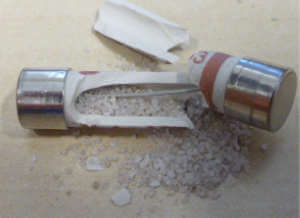 The length of the fuse measures 24.91mm. 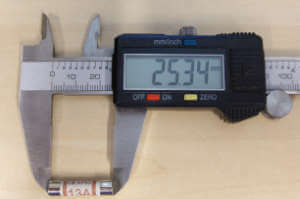 A BS1362 fuse should have a length of 25.4mm with a tolerance of +0.8/-0.4mm. 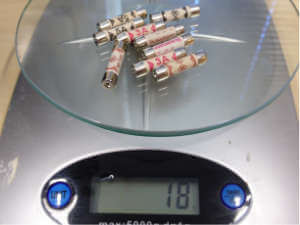 The combined weight of the 8 fuses is 18g. 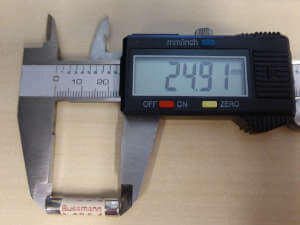 The weight of 8 genuine fuses on the same scales is 23g. This indicates that they probably do not contain the required sand filling. Breaking the fuse open confirms that these fuses are counterfeit. There is no sand filling. The quartz sand inside a genuine BS1362 is designed to control the rupture of the fuse wire within the ceramic body. 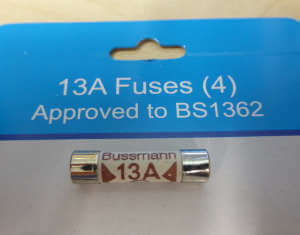 The genuine 13A Bussmann fuse also has a solder bead on the fuse wire which is missing on the fake. 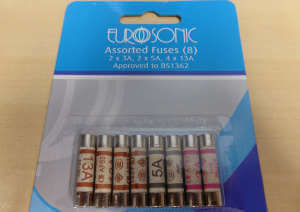 The third pack is branded as Eurosonic and contains 8 mixed size fuses. 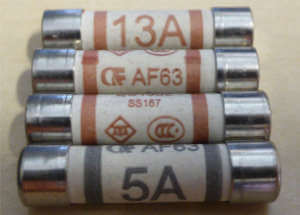 The fuses have the ASTA approval symbol and appear to be branded 'CF' and marked AF63. (A BS1362 fuse must have the manufacturer's name or identifying mark.) They also have a number printed on them: SS157. The metal end caps are shiny like the previous two packs. 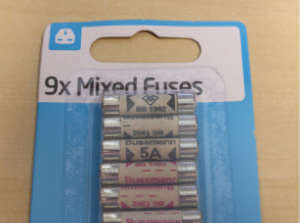 The 3A and 5A fuses also have larger than normal dimples on the caps. A requirement of BS1362 is that "The end surfaces shall be substantially flat". 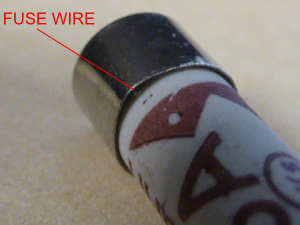 There is no evidence of a trapped fuse wire, although the shiny caps and large dimples indicate that these could also be fake. The fuse meets the dimension requirements of BS1362. Breaking the fuse open shows it has a sand filling. So it appears that this pack does meet the requirements of BS1362. Although I'm not sure that the end caps of the 3A & 5A fuses would be considered as substantially flat. 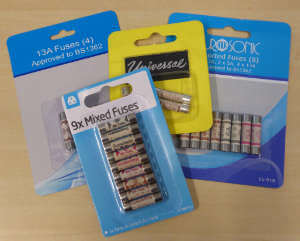 The final pack is yellow labelled ‘Universal’ and contains three 13A fuses. 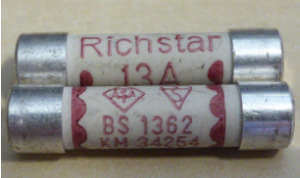 The fuses are branded as Richstar and have the ASTA and Kite marks. The end caps have a dull matt finish. These look to to be genuine. There is also an ASTA licence number:497 and a Kitemark number: KM34254. BEAB website and BSI Kitemark website both have a search facility to check the licence numbers. I couldn't find a matching licence on either site. 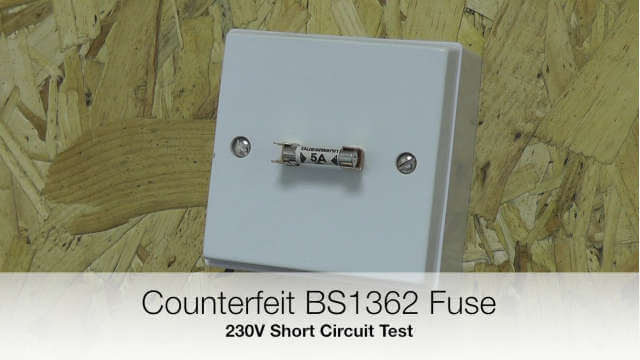 I contacted BSI and they confirmed that the Kitemark number is not registered and the fuse should be considered as counterfeit. 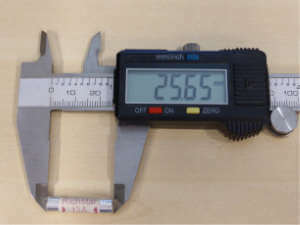 The dimensions meet the BS1362 requirements and it also contains a sand filling. 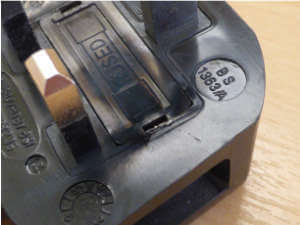 If it were not for the incorrect licence numbers being printed on the fuse, there would be no reason to suspect that these were counterfeit. 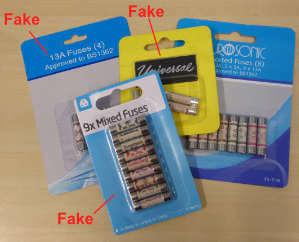 Three of the four fuse packs purchased can be confirmed as counterfeit! 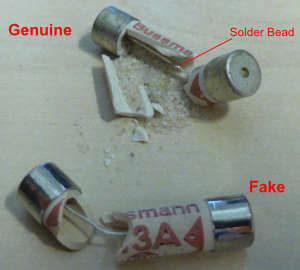 Unfortunately this proves how difficult it is to tell the difference between counterfeit and genuine BS1362 fuses. The ASTA, BSI or Nemko approved symbols do not prove authenticity. 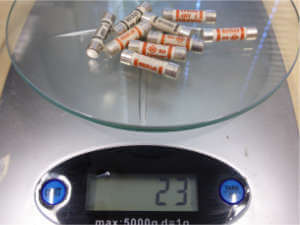 The first two packs containing Bussmann fuses could be identified as counterfeit during a PAT inspection by the shiny end caps. Well known fuse brands such as Bussmann, SEM, Marbo etc. all have dull/matt finish metal caps. 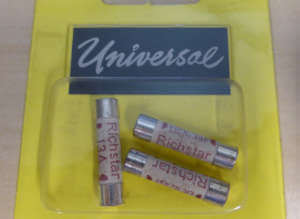 The unknown Richstar brand fuse would not be so easily identifiable as a fake. 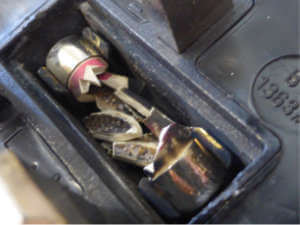 Trading Standards report that counterfeit fuses "may explode violently and may blast the top of the plug or blast the plug from the socket”. So I decided to put a counterfeit fuse to the test! This is the result of deliberate short circuit across the line and neutral conductors in an IEC cord fitted with a fake 3A fuse from the second unbranded pack. 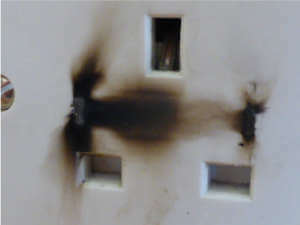 The plug was not blasted from the socket, but the fuse exploded and left a scorch mark on the socket outlet! I thought it might be interesting to capture a video of the fuse in operation during the short circuit. This is a 5A fuse taken from the second pack connected to a standard 230V ring circuit with a 32A MCB.